Quietly and without fanfare, NorthBay Healthcare has been using SPY Elite System technology to save the skin of surgical patients. It may sound like the plot of an espionage novel, but it’s really advanced medicine at its finest. 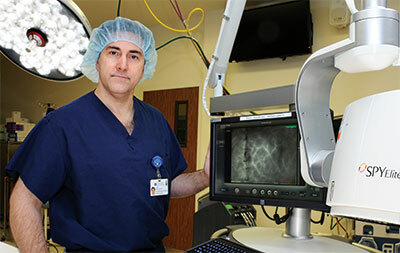 Championed by Oncoplastic Surgeon Jason Marengo, M.D., NorthBay Healthcare made the decision to invest in the $250,000 device earlier last summer, making NorthBay Medical Center the only civilian hospital in Solano County with the technology. The equipment helps surgeons assess how much blood is flowing to critical areas in the body during and after surgery. Dr. Marengo is on a mission to educate his fellow physicians about the uses of the machine, which he says can be helpful in general surgery, cardiac surgery, urology, orthopedic surgery and even podiatry. “It’s simple to use. A patient is injected with a safe, green dye, and then the machine uses an infared laser to stimulate the florescent properties in the blood, so a surgeon can see the blood flow,” he explains. Dr. Marengo said the SPY system has shown to lower the rate of complications in immediate breast reconstruction from 15 percent to 4 percent.